Mid-Swan Project area and vicinity map. The project has a big name to go with its big footprint: The ‘Mid Swan Landscape Restoration and Wildland Urban Fuels Reduction Project.’ It would cover some 70,000 acres of forest stretching from just south of Swan Lake down to Condon. That’s almost 30 percent of that area’s landscape. “What we’re looking to do is foster the development of a resilient landscape. Really restore a lot of what has been the effect of fire exclusion for the most part – that’s the broadest effect – and then also to restore some effects of past treatments – roading, harvest, those kinds of things,” Weber says. To do this the Forest plans on taking a multi-pronged approach, including prescribed burns and stream sediment reduction projects. Timber harvests would be another potential tool. Weber estimates that up to 60-million-board feet of timber could possibly be harvested. He says that’s a conservative estimate at this point. But one environmental group rips it as just another big logging proposal that would do more harm than good. Keith Hammer, chair of the Swan View Coalition, says that group is still sifting through the proposal’s specifics. His first impressions: “What it does is it does a bunch of logging, builds a bunch of new roads in the Swan Valley, which is known to have historically been over-roaded and over-logged in the first place.” Hammer says. Weber says that’s too simplistic of an interpretation. “A lot of the proposal is either setting conditions for natural fire to burn in a more resilient way than is currently happening. Or actually applying prescribed fire to the ground to restore fire back to the ecosystem,” Weber says. The Swan View Coalition’s Keith Hammer also worries the Flathead Forest is setting itself up to dump more sediment into streams, not less. 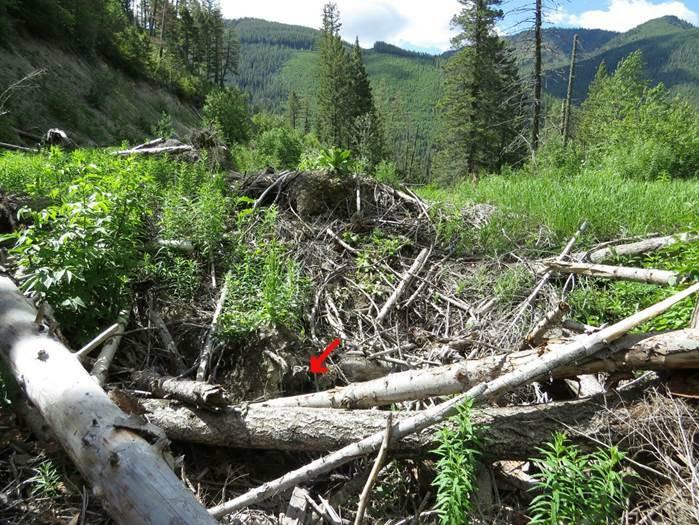 A clogged culvert buried in avalanche debris on Goat Creek Road #10503. “So they’re going up into high elevations and would build roads through avalanche chutes," Hammer says. "They have had culverts that have plugged and failed on the Flathead National Forest due to avalanche debris. It’s one of the last places you want to build logging roads." He also worries about the landscape-level scope of the proposal, which he says is locally unprecedented. Chip Weber says the forest will get more bang for its buck this way, adding science supports affecting large-scale change. The Flathead Forest developed the proposal with the ‘The Southwest Crown Collaborative’, an independent volunteer-based project that works with the Lolo, Flathead and Helena-Lewis and Clark Forests on restoration projects. Keith Hammer says the Swan View Coalition has participated in several collaboratives and always walked away disappointed. “Every single one of them has helped the Forest Service to get around its own laws and guidelines and its own forest plan. And that's why we don’t go full-term with these collaboratives. We reach a point where they want to break the law and we say ‘no, we’re not going to help the agency break the law.'" A public meeting on the Mid-Swan Project will be held November 8 in Condon. Comments will be accepted through November 21.